Detox on the Rocks please! If you follow me, you now know that I am the healthy type. I love Good Food and Home Made: less chemicals, less fat, more freshness, more flavour, more fun! 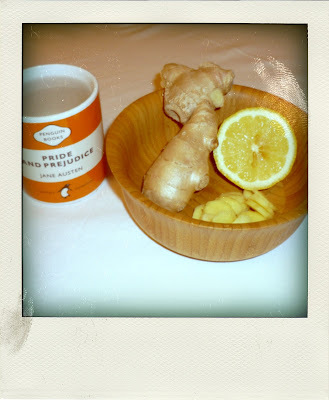 So here is the healthy variant to the liters of Coffee and Tea I tend to drink: Ginger and Lemon Tea. Cafeine free, Theine free, it doesn't colour the teeth and has a very subtle taste. Just peel some fresh Ginger, and cut a few slices. Put them in a Mug and pour boiling water on them. Then add Lemon Juice. That's the way I like it, but if it is too acidic for you, you can add a teaspoon of Honey.